Yo! Yo! Its time to get your Yo-Yo on with the Original & Best Selling String Trick Yo-Yo of All Time! 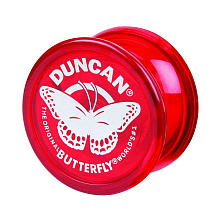 The Butterflyl Yo-Yo by Duncan features a wide string gap, durable plastic body, bright colors, a fixed steel axle and is perfect for basic string tricks.